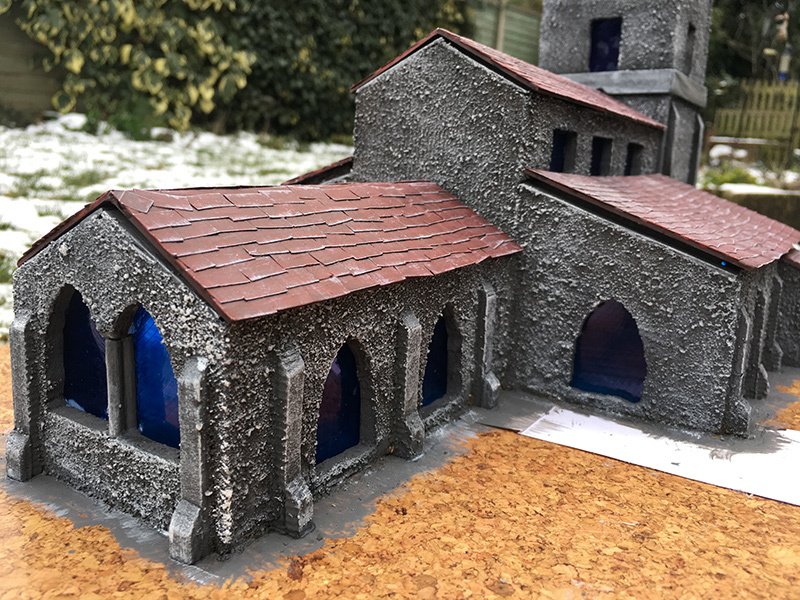 On Friday evening I had a flash of inspiration and decided to build a church. 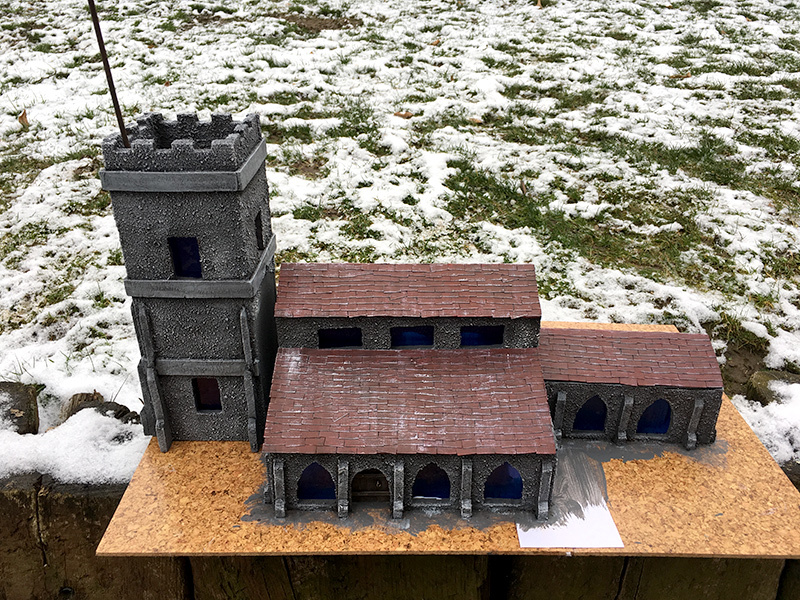 I had no idea what I was going to end up with and Googled 28mm churches for a few ideas. 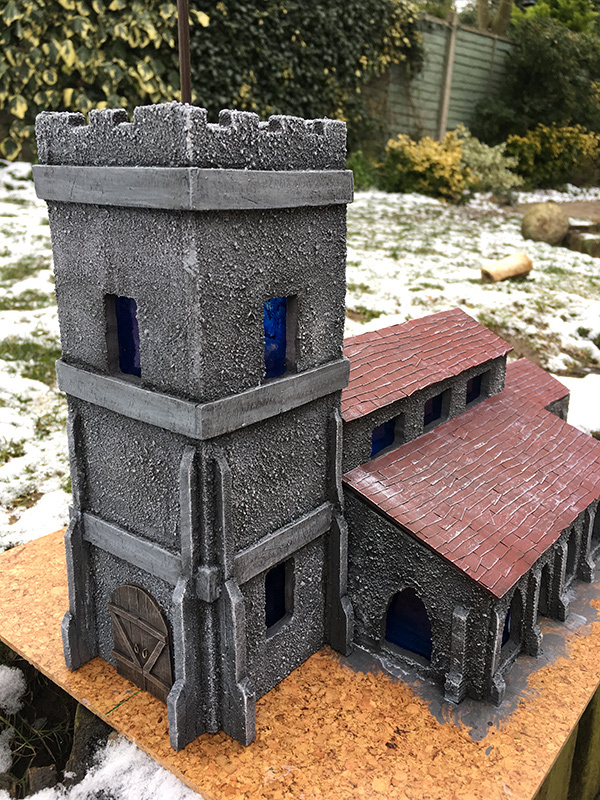 I decided to base mine on one I quite liked on Google and set about making it out of my favourite modelling material; underfloor heating insulation foam. 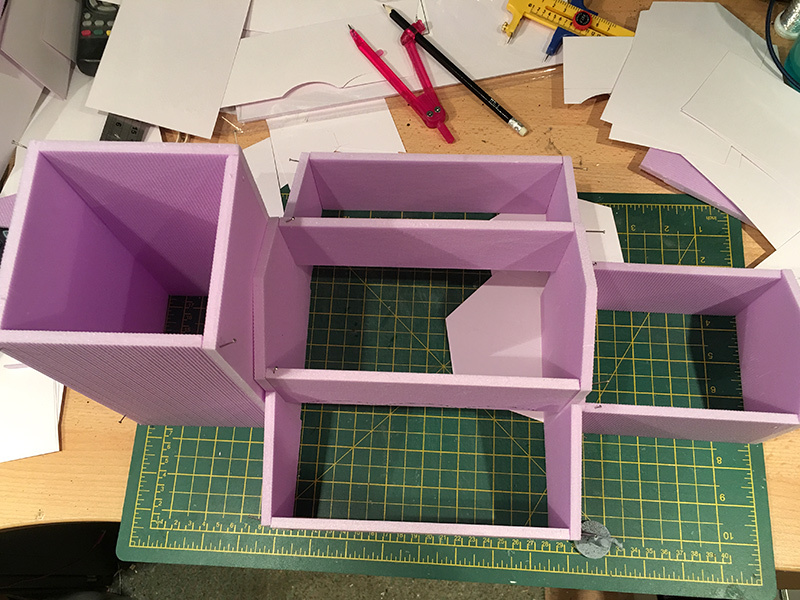 Initially, I made templates out of card just to make sure the boxes I was making the church from all fit together. 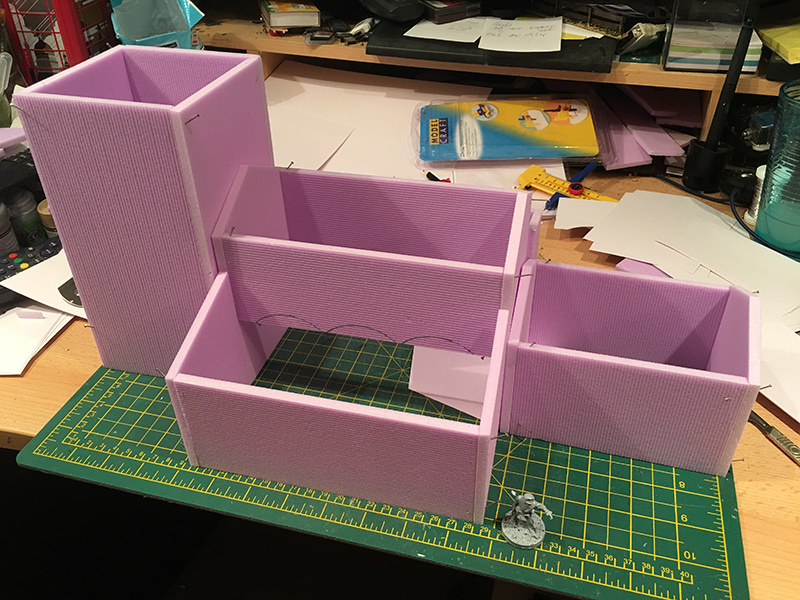 When I cut all the pieces out and pinned them together, it looked a bit large so I ended up chopping an inch off the bottom of all parts. None of the windows and doors were measured as such. 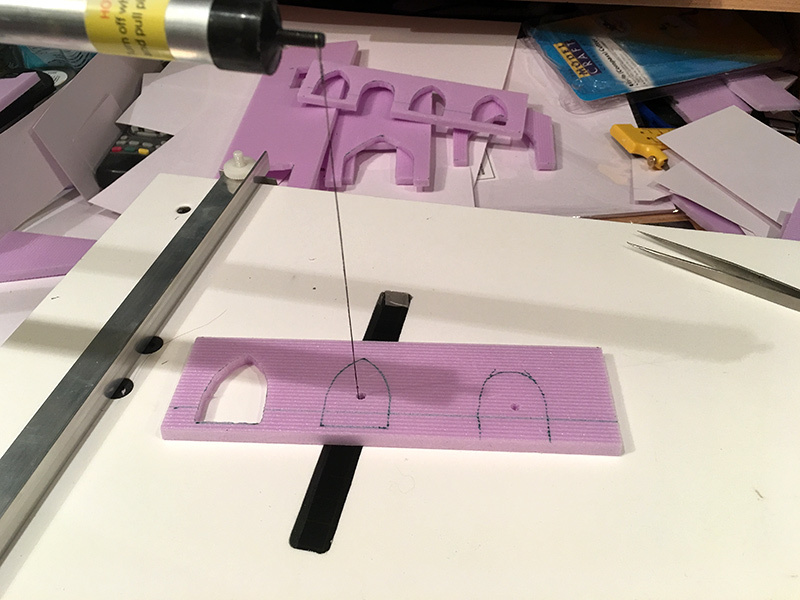 I just used a 28mm German SS officer and guessed a reasonable size of doors and windows which I cut out using my trusty desktop hot wire cutter. 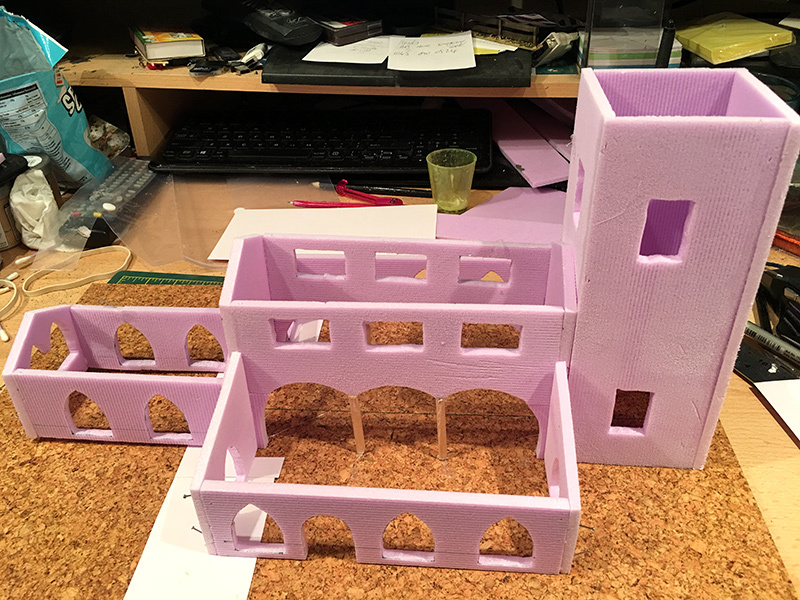 Once the four rooms of the church were completed, I started on the roofs. 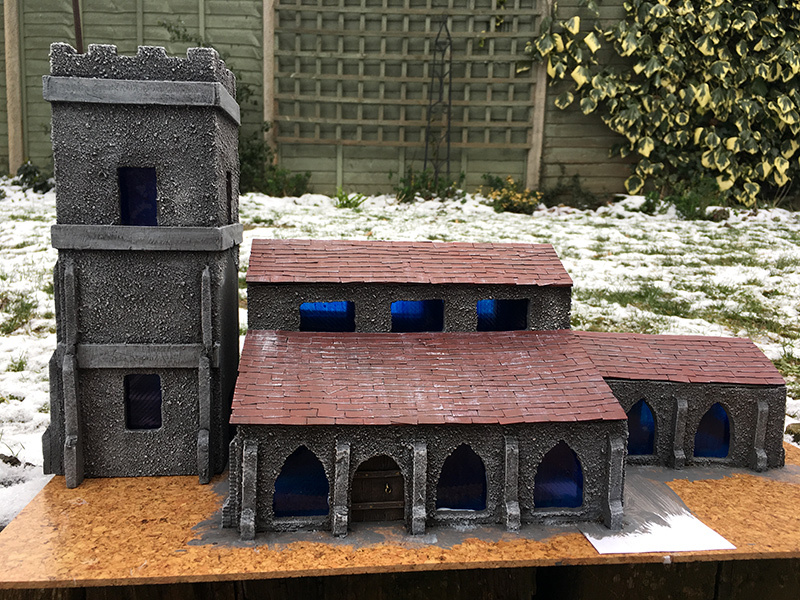 These were made from mount board as the base with individually cut out tiles which I made from sheets of thin card. Gluing all the tiles in place was a laborious task done in front of Saturday night TV for a few hours, but they do look more individual than my other style; scoring the tiles into a sheet of foam. 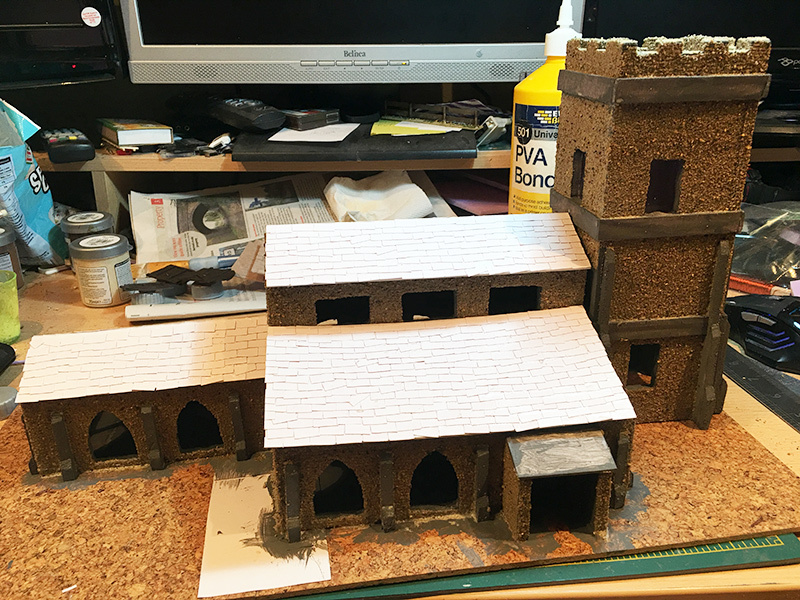 I gave the external walls of the church a coat of sand to give it some texture and once everything was dry it was time to paint. Painting consisted of an overall coat of grey, then a wash of black. I then added two dry-brush coats of light grey and white. 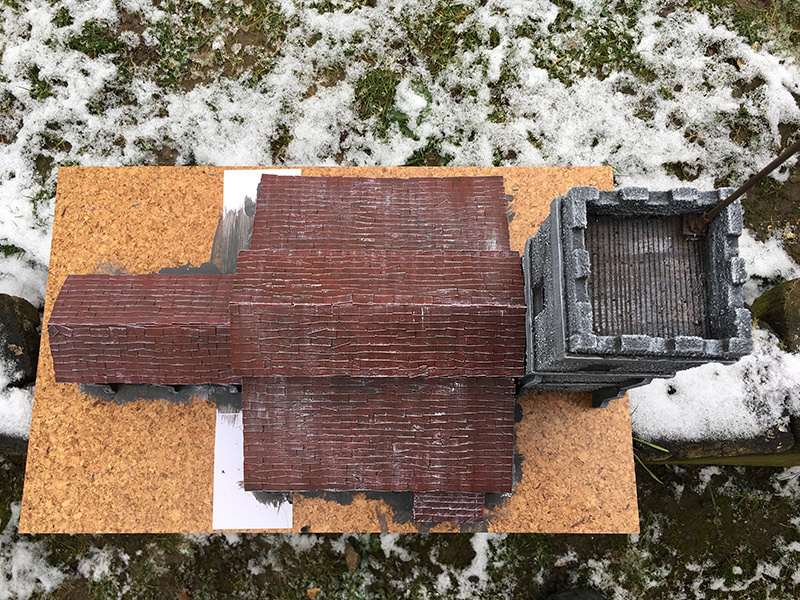 The roofs were painted Hull Red then a black wash, then a dry-brush of red and white. Once everything was painted I then did the windows. These were made from plastic document wallets obtained from my local Poundstretcher, 5 wallets for a quid. I have painted these a plain ink wash blue using some blue ink from Citadel which must be a good 10 years or more old. I then stuck these to the inside of the walls. 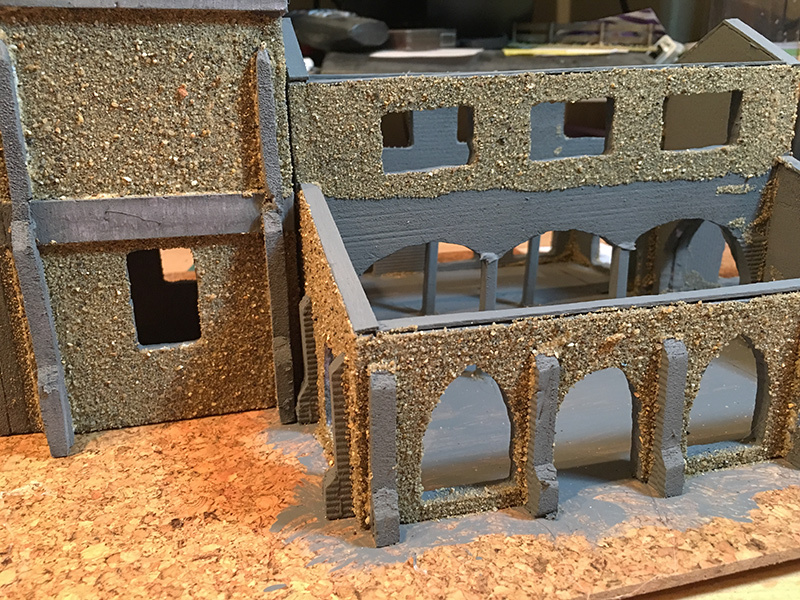 I made floors out of think sheets of foam which have flagstones drawn onto them just to give a better look when the roofs are off and troops are inside on the wargame table. The doors were made of cut up coffee stirrers with little wire door handles. 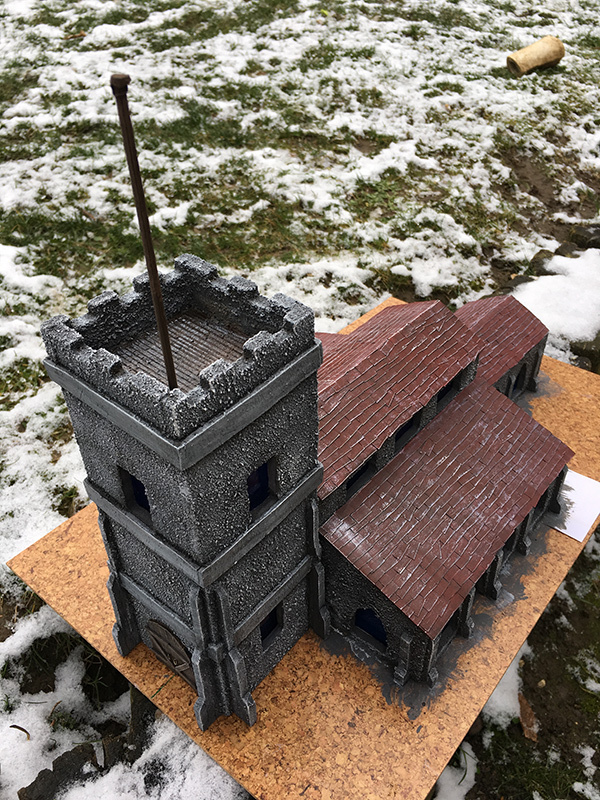 I added a flagpole which is magnetised and will fit on the top of the bell tower. 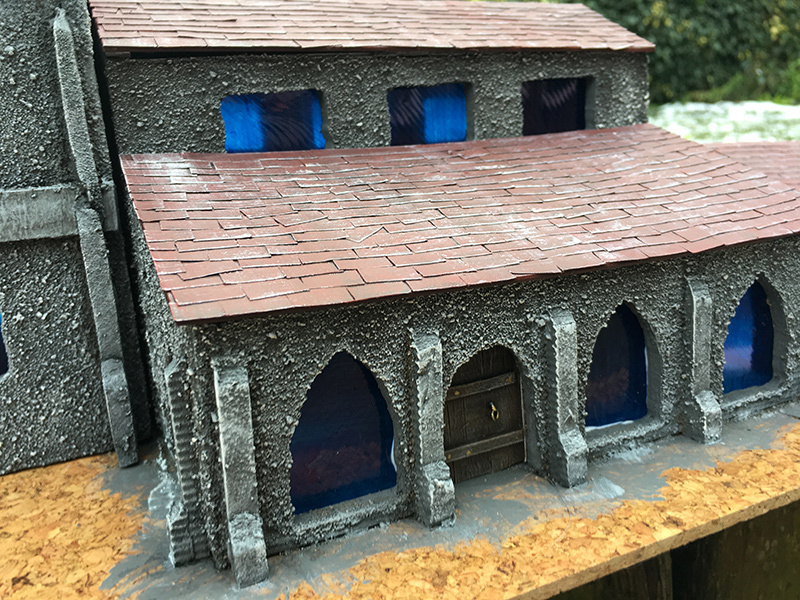 Overall, I’m very happy with the finished building. 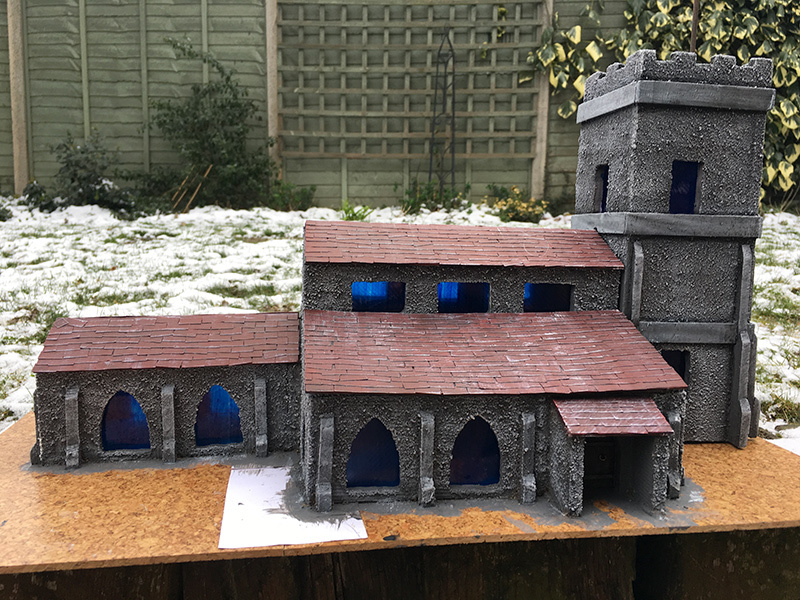 I just have the grounds around the church to do which will involve a coat of sand. 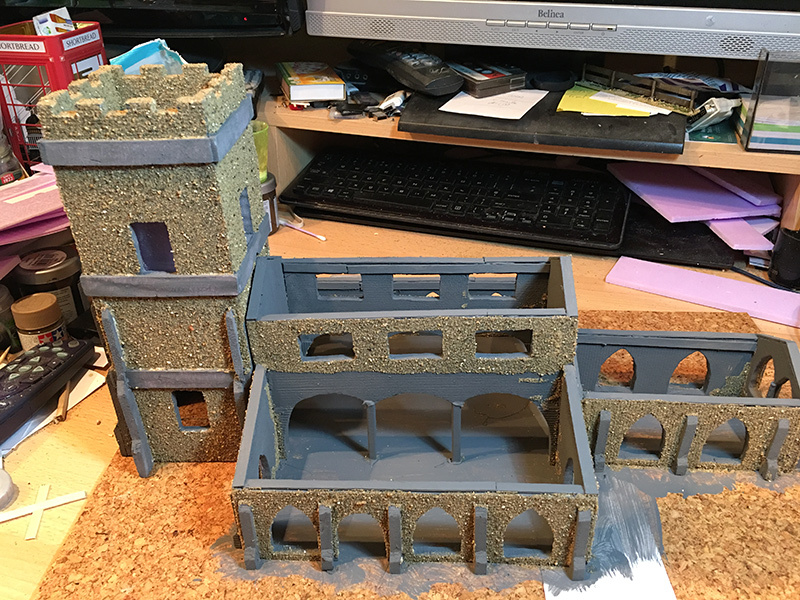 I’ll add some grass and maybe a path or two and will think about adding some tombs or gravestones. A cemetery to go alongside with some walls around the church perimeter would be good. 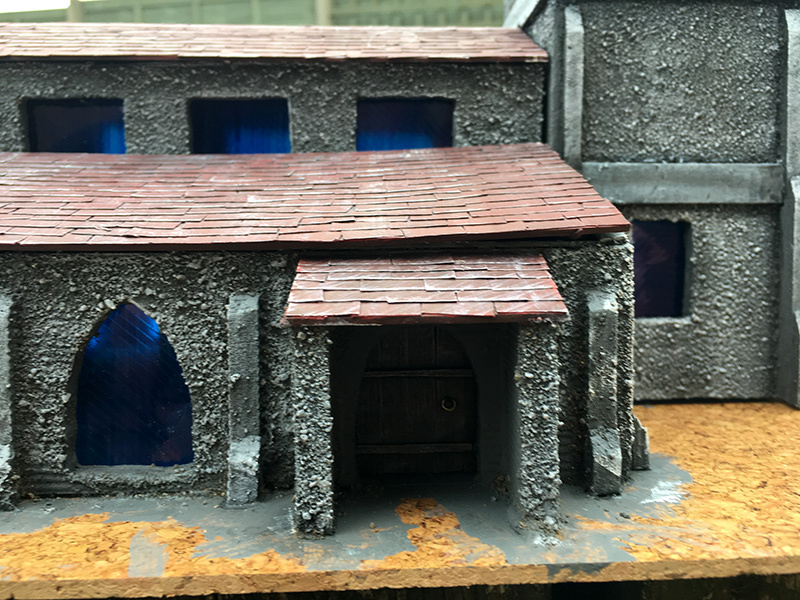 I’d like to find a way to do more ornate door and window frames but I’m not sure what to make them from or whether I might need to buy some in and use them in my buildings. Some experimentation, when I have the time, is called for.